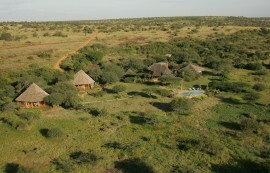 Mutamaiyu House is a family owned house located in the expansive Mugie Conservancy in Nanyuki. 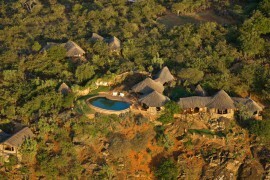 It is perched on top of a hill overlooking the vast savanna around it. The house boasts a lavish sitting room, high ceiling verandas and a large dining room situated in a prime viewing area for the waterhole below where day and night the interaction of wildlife present a wonderful spectacle.A short walk through the impeccable gardens takes you to a cliff-top swimming pool and bar with stunning views. Some of the activities to be done here include game drives, painting and sketching, swimming, visiting the cultural village, golfing and guided bush walks. Children below 5 Years Stay free of charge. Accommodation at Mutamaiyu House is in 6 traditionally thatched African styled cottages that can hold a capacity of 12 people. 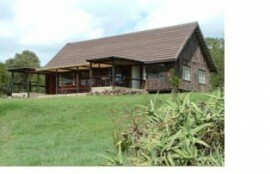 Each cottage is en suite with shower and bath, a living room and a log fire. The main house has a large living room, high ceiling verandas and a huge dining room. Dining at Mutamaiyu House in the large dining room set to overlook the water hole where animals come to drink day and night. 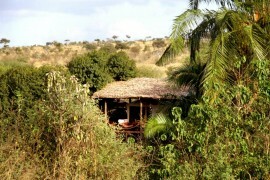 All meals, including bush breakfasts are provided. There is fully stocked bar with wines, spirits, beers and soft drinks. The bar has stunning views of the vast land.